Haifoss is easily one of my favorite waterfalls in the whole country of Iceland, but I almost didn’t visit it at all, because it’s one of the harder waterfalls to reach and I only had a 2WD vehicle on my trip. 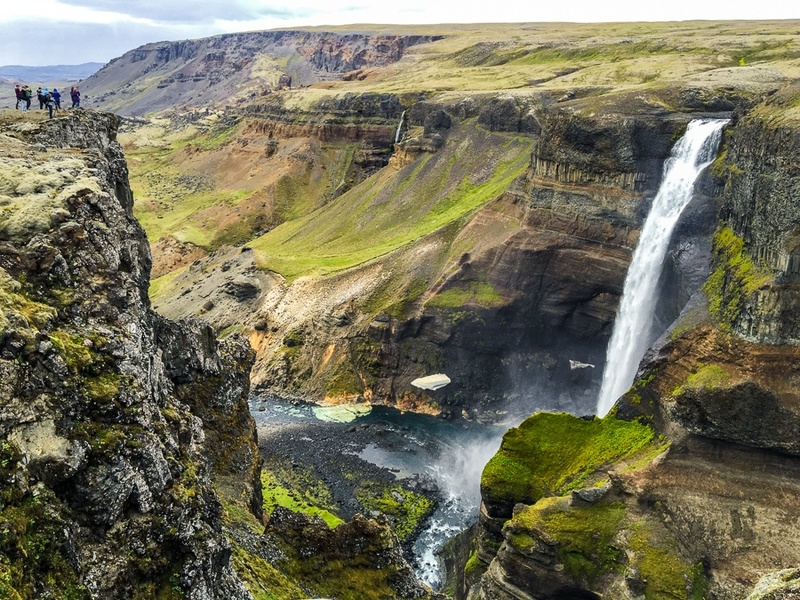 The main waterfall is 400 feet tall, making it one of the tallest waterfalls in Iceland. There’s also a second (huge) waterfall running into the same canyon, which is a pretty impressive canyon in itself. The resulting panoramic views you can get here are mind blowing! Visiting the falls generally requires a 4WD vehicle (which I didn’t have), so I decided to park and hike to the falls, despite the lack of info on this back when I visited. I almost had to turn back halfway through my hike because a big storm was coming in, but then it went away (Icelandic weather is random like that), and I was able to continue. As of 2019, the road to Haifoss is still very rough and full of huge potholes, so it requires a 4WD vehicle with a lot of clearance, or else some hiking. Don’t let this hold you back. Haifoss is without a doubt one of the best waterfalls in Iceland. The full hiking directions can be found below. Haifoss is located in west Iceland, near the highlands. With a 4WD vehicle and high clearance, you can drive directly to the waterfall parking area and no hiking is needed. Still, the drive takes 2.5 to 3 hours from Reykjavik because of the spotty road conditions. With a 2WD vehicle it’s still possible to visit Haifoss, but it’s a bit more complicated. You will need to drive to Gljásteinn Hólaskógur Hostel, park your vehicle here, and hike the rest of the way to the waterfall. This hostel is the closest you can safely park to the waterfall with a 2WD vehicle. I would NOT recommend driving past the hostel with a 2WD vehicle. The road becomes extremely rough and there’s a good chance you might damage your 2WD rental car if you keep going. From the hostel parking lot, the one way distance is about 3.5 miles (5.7 km) and it will take about 1 to 1.5 hours to hike to the waterfall from here. It’s not too bad doing this as a hike, but you’ll need to get an early start! I stayed overnight in the hostel parking lot (with their permission), and then hiked to Haifoss the next morning.